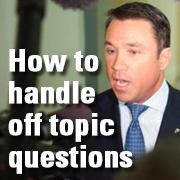 After the president’s recent State of the Union address, Rep. Michael Grimm of Staten Island lost his temper after a reporter asked him questions that were “off topic” and threatened to physically harm the reporter (the full story can be found here). Grimm has since issued an apology. While this incident is extreme in nature, it underscores the importance of being fully prepared for an interview, regardless of the direction it takes. Everyday interviews are fabulous opportunities to showcase your knowledge and build your public reputation, so following these five media training tips will be well worth it. Know your audience: Prior to your interview, take a few moments to learn about the outlet’s demographic. Most trade and business publications include demographic information in the media kit they post to their websites. If it is not there, and there is time, ask the reporter to share the information. Understanding the audience will help attorneys tailor how they deliver their key messages. Know the reporter: Again, take a few moments to read some of the articles that the reporter recently published. This way you will have a sense of her style and what issues are important. It also helps build rapport with the reporter if you are able to reference an article she wrote. At Jaffe PR, we often prepare briefing sheets for our law firm clients that include the publication’s demographics, some biographical information on the reporter and a few recent articles. Know what you are getting into: Often reporters will share a few questions or a broad outline of what the interview will cover. If not, do a little bit of research on the topic to make sure you know your facts. Have a sense of what you are going to say: Think about the issue that you are discussing ahead of time, and jot down a few key messages. Refer to your notes during the interview to ensure that you are not going off topic. If you are asked a question that you are unable to answer, try to steer the discussion back to the messages you want to communicate. Think before you speak: Last fall attorney Lanny Davis did not speak highly of his client, Washington Redskins owner Daniel Snyder, during a radio interview. The star power of the attorney and client minimized the impact, but you might not be so lucky. Once you say it, you can’t take it back. So, if you are speaking about a particularly sensitive issue, choose your words carefully. Grimm, who is up for reelection, has faced questions about an ongoing federal investigation into his campaign fundraising, which he did not want to discuss. Perhaps if he had spent some time crafting some key messages to share with the media, he would not have damaged his public reputation. For more tips on making the most of your media interviews, email me at sholtzman@jaffepr.com.